8 tracks, 45 unique car models, and over 300 different car variations. Sensational graphics and lighting effects give every race a cinematic feel. Battle head-to-head in the 2-player, split-screen VS. mode. Experience all the ups and downs of a full racing season with your team in the Grand Prix Mode. New cars awarded based on your performance in every race. Design original logos to customize your car. Namco released a special box set with the complete R4 game bundled with the Jogcon controller. The box sets were individually numbered on the inside flap. One of the games featured on the PlayStation Classic released in 2018. The Bonus Disc includes the original Ridge Racer and then a 60fps version where you can play the Time Trial or one-on-one mode in super high resolution mode. It also contains some bonus content. 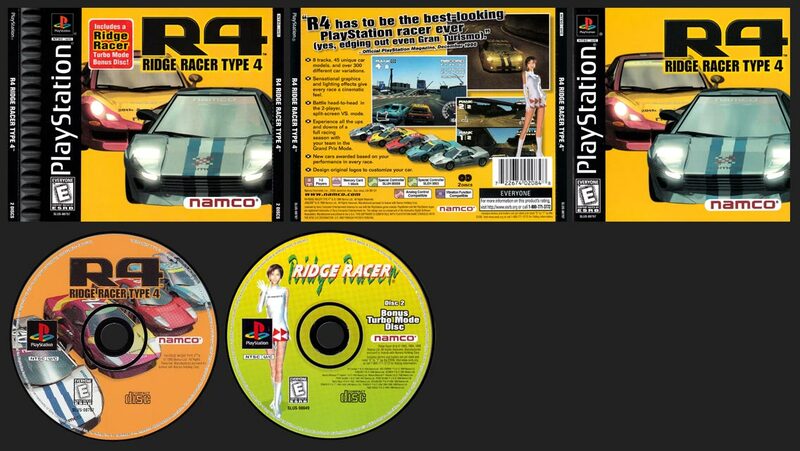 R4: Ridge Racer Type 4.